Miracles are timid, fragile beings. Lucas, the child, which no one believed in any more, brought the belief in miracles back into Dana’s life. Friends painted angels. They stroke the restless soul and guard over the depleted body. Diagnosis breast cancer. 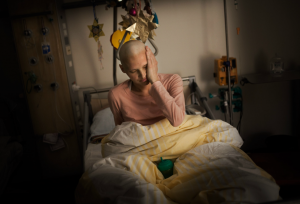 In Germany alone, 57.000 women fall ill every year, the numbers rising. Most patients fall ill after menopause. With early diagnosis and optimal therapy, they are able to receive a nearly 100 percent chance of healing. Dana is 25, loves and challenges life while feeling the knot under the skin. After breast amputation and chemotherapy she decides for a new life in a different city. And for a son, who ekes out his place in this world, despite medical prediction. A short, a turbulent life – towards death and against time. Nine years later, Dana lies a the palliative care unit of a hospital, somewhere in Germany. She met many people in this other town. She guarded the most precious amongst them, strung them together like pearls on a string. Sickness often causes loneliness. Dana is not lonely. Which is very rare according to the ward nurses who watch the many visitors in room H438 with benevolence. Dana succeeded in uniting very different people and in creating a circle of friends who carry her to the end and whose single chains support each other. In this way, a unique network was born: the friends meticulously coordinate visiting hours and the daily sleep-over guest, they sooth the dying with massages and surprise her with a cello concert at her own bed. Love fills the room, cloaks it in security and gentle farewell. Miracles astound us. Miracles are rare. Friends too. (Ines John). Awards for “Go, my beauty”: International Photography Awards 2011, Hansel-Mieth Prize 2011, FotoDoks Award 2010 and a nomination for FreeLens Award for Young Photojournalism 2010.